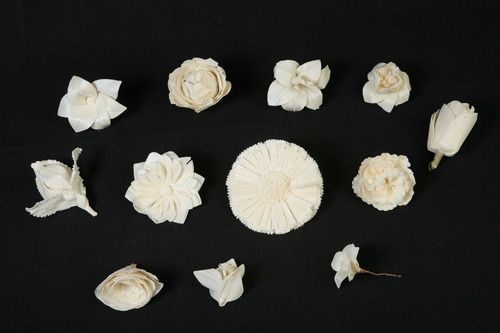 Sola Flowers are extracts from a tree, thus are natural and are hand-crafted flowers. They can also be coloured to any required colour. They are available in different shapes and sizes and also preferred in their natural form with its skin on. Highly in demand are, sola rose, sola bud rose, sola zinnia, sola sun flowers, sola gardenia and sola chips with skin. We also make sola wreaths and sola arrangements on stems, bouqets as per our buyers design and requirements. We also offer a wide array of sola natural balls, such as sola cabbage balls, sola crepe ball w and w/o skin.. etc. Radharam Sohanlal came into existence in the market in the year 1921. One can contact us in our head office which located in West Bengal in India. Being pioneers in the industry, we are engaged in manufacturing, wholesaling, exporting, trading and supplying a wide assortment of Decorative Potpourri, Sola Ball, Exotic Dried Flower and many more products. Our major export markets are North America, Europe & Middle East. Our products are highly recommended amongst the customers for their freshness and nice fragrance. We offer products to our patrons as per their needs and in various colors. The offered products are used for decoration, in occasions and many more purposes. Customers can avail quality approved and beautiful products from us. We offer products to our customers at industry leading prices and in safe packaging to ensure their faultless delivery to the clients. We are looking query from the Export market.